Rena is short of "reittinauhuri" (finnish, meaning track recorder). 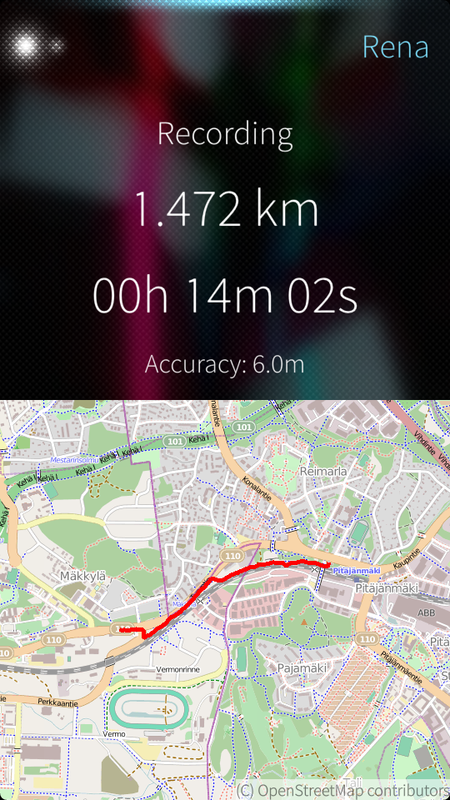 Rena records your track when you walk, run, cycle or practise any other outdoor activity. It uses positioning capabilities of your phone, ie. GPS and GLONASS in case of Jolla. Tracks are saved in GPX format for compatibility between various applications and services. There seems to be a problem in latest Sailfish. The latest version of qt5-plugin-geoservices-osm is missing. I know this is not the fault of the Rena app, but does someone know how to solve it? (Warehouse installation failed, that is why I used the zypper command to show the error). Ignore the above post. It was the app registry (?) that was in some kind of inconsistent state. It was fixed by "pkcon refresh" and then I was able to install Rena. I would like to be able to edit names and descriptions of saved recordings. Could you allow that? Editing old recordings would require moderate effort to do it right (so that it works with recordings made with other software as well, without losing information while doing it). I'm not currently actively developing Rena, so unfortunately I would not expect this anytime soon. Kudos for Rena, as it is still a great app. Recording, saving, loading and displaying GPX tracks, while displaying an OSM online map. a. The file names generated by Rena contain colons (":") and spaces (" "), which are problematic under Unices (e.g. at the shell). Please restrict the characters for for file names generated by Rena to letters (both, capital and small ones), numbers, the dash ("-"), the underscore ("_") and the full stop (". "), plus maybe the hash mark ("#"). b. I cannot open the GPX files generated by Rena in some other GPS applications. I tried unsuccessfully with recent (as of July 2016) versions of Maep for SFOS and GPS Logger II for Android, while importing in MeeRun for SFOS and OSMand~ works. a. You are right, some filtering of characters should be done for user convenience when track name is formatted to filename. Actually Unix is the most forgiving OS in that sense, there is only two forbidden characters, and for special characters in a GUI there is no problem and at a shell you just have to escape them properly with \, or just quote the whole filename with "". Thinking a bit further, the most common forbidden characters of different file systems should be filtered out, for cases where people move files to Windows machines etc. b. I tried to open few tracks with Maep on Jolla phone (from Jolla store), and they worked well. Perhaps it have been updated in the meanwhile? I don't know about GPS Logger II for Android, it seems I can't even find a software with that exact name. Could problem be at that end, since few other applications seem to work right with GPX files recorded with Rena? Would it be possible to choose different maps? With my aging eyes, it becomes difficult to see some details and I recently discovered maps where labels are written bigger (and have a beautiful design): Mapbox Emerald/Outdoors @2x. Unfortunately the map engine doesn't currently support custom map sources. It should not be impossible but needs some work. Brilliant :D Do you take donations? I can't donate much but I would like to support your work. I don't take donations, but thanks for the gesture! Thanks for the last feature you added, Rena has become great! Any reason why there is no 3 seconds recording? I think it's a well balanced value. Any plans to add other maps like Opencyclemap? No specific reason for leaving 3 second interval out, more options or custom value possibility could be added. Let's see about other maps, Qt location does not support other maps than Here and OpenStreetMap "out of the box". I guess new map plugins could be done though. This is a great app! You must do some very clever filtering to get those GPS tracks so clean. Seems that app is also power efficient and can shut down GPS while track recording is paused in order to save battery. I've got couple of suggestions for an added features. 1. Possibility to select folder where tracks are saved. 3. Add possibility to rename and change description of file in History page. Now you can only delete track. Thank you for creating this great app. GPX files are saved to directory called Rena under the user home directory, i.e. /home/nemo/Rena. Name syntax for the files is "yyyy-mm-dd-Thhmmss - name.gpx", in UTC time. I will keep your suggestions in mind. Thanks for the aditionnal features in V0.0.6. Ja sama englanniksi; onko tuohon tulossa tukea sykevyölle? Ois aivan ehdoton :) Kiitos. Currently I have not planned to support heart rate sensors. First I am focusing on just tracking the location. I can look into adding these. Thank you for your application, it's really nice!! Please try if version 0.0.5-2 brings the map alive. Thank you!! Now it's working fine!! Are you still working on this app? If yes, I would appreciate to browse / zoom the map also while recording. I am still working on it (every now and then at least). I can make recording map browsable at some point. Good to hear that, and nice improvements in this last version.